According to the survey results, nearly two-thirds (63 percent) of employed U.S. adults believe that their office could better utilize its physical space, and one-third (34 percent) say improvements can be as simple as a better floorplan. The survey, which was conducted by Harris Poll on behalf of Coldwell Banker Real Estate, dba Coldwell Banker Commercial Affiliates, surveyed over 2,000 adults, including Younger Millennials (18-29), Older Millennials (30-34), Gen Xers (ages 35-49) and Baby Boomers (50-69), to identify worker attitudes toward their current physical workplace and better understand how office space can be optimized to meet worker needs and comfort. The survey also uncovered which popular office amenities resonated with respondents to see how office spaces could further improve the functionality of their square footage. Overall, the survey found that ample parking, food courts and outdoor lounging space were the most coveted office amenities, signaling a desire for convenience and a sense of community. Nearly 8 in 10 U.S. adults (79 percent) report they would feel comfortable with an open floorplan if private spaces were available. This is especially popular among the newest generation of workers. Nearly 9 in 10 Younger Millennials (89 percent) would be comfortable working in an open floorplan if private spaces were available. “Open floorplans can facilitate collaboration and creativity within the office, but it is also important to carve out private spaces in order to provide a break from the buzz around the office. We’ve noticed an increased demand for private space within the open office after years of conducting this survey. It is imperative that office developers and commercial real estate professionals alike counsel clients on the wants and expectations of today’s workforce,” added Schmidt. 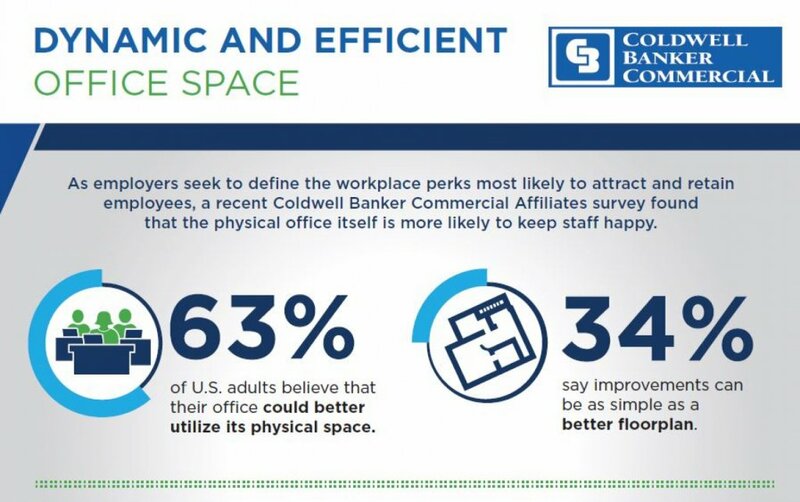 For more information on Dynamic and Efficient Office Space, contact the Office Specialist, Chip Sistare at Coldwell Banker Commercial Benchmark at 904-421-8546 or csistare@cbcbenchmark.com. Methodology This survey was conducted online within the United States by Harris Poll on behalf of Coldwell Banker Commercial Affiliates from August 15-17, 2017 among 2,001 adults ages 18 and older, including 194 Younger Millennials (18-29), 160 Older Millennials (30-34), 479 Gen Xers (35-49), and 884 Baby Boomers (50-69). This online survey is not based on a probability sample and therefore no estimate of theoretical sampling error can be calculated. Coldwell Banker Real Estate LLC, dba Coldwell Banker Commercial Affiliates is a division of Coldwell Banker Real Estate LLC. The Coldwell Banker Commercial brand has been a premier provider of franchised commercial real estate brokerage offices, recognized globally as a company that puts the client first while delivering individual, distinctly different service. Coldwell Banker Commercial affiliates cover territory throughout North America, South America, Europe, Africa, Asia and Australia. Coldwell Banker Commercial is an industry leader in providing commercial real estate solutions that serve the needs of tenants, landlords, sellers and buyers in the leasing, acquisition, disposition and management of all property types. Each office is independently owned and operated. Coldwell Banker Commercial® is a registered trademark owned by Coldwell Banker Real Estate LLC. For more information, visit: www.cbcworldwide.com.